Corruption, under-investment in public goods, and weak accountability are common in many developing countries. It is widely believed that these problems are more severe where government depends on revenue windfalls (natural resources, foreign aid or central government transfers). Bad governance in turn reflects a lack of will or ability on the part of citizens to restrain politicians from engaging in behavior that reaps private benefits at the public’s expense. 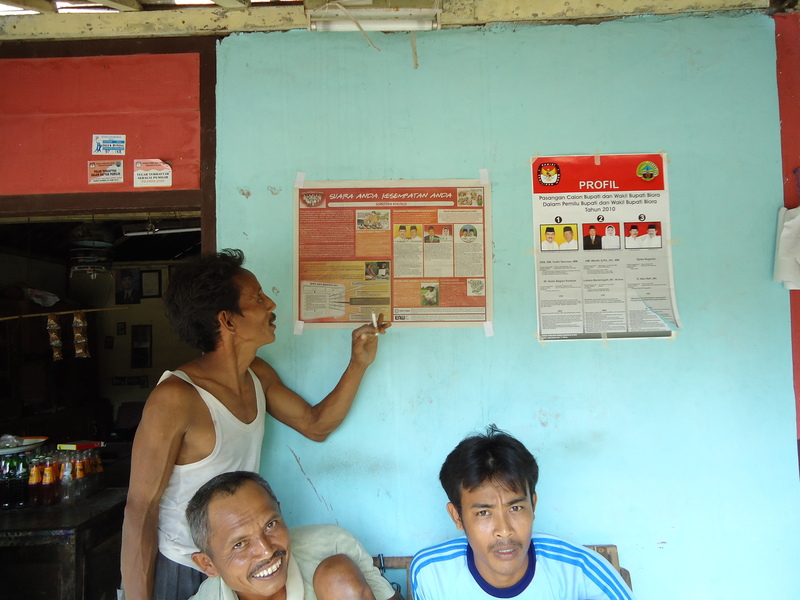 To investigate how to mobilize citizens to become more active and engaged keepers of the public purse in windfall contexts, I conducted a public awareness campaign and research project with the Indonesian NGOs PATTIRO and LPAW in Blora, a resource rich district in Indonesia. Three academic papers (two of which are in my dissertation) and one policy paper are currently being produced from this project. 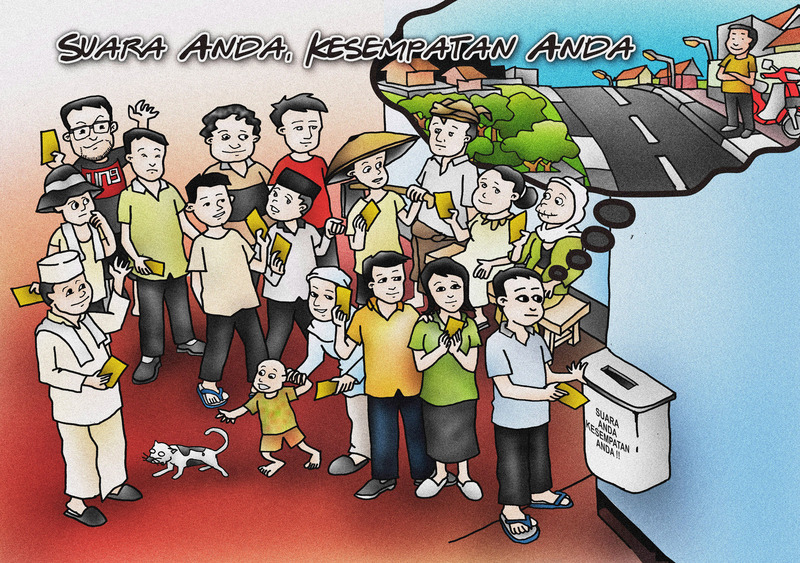 The “Your Voice, Your Opportunity” (Suara Anda, Kesempatan Anda) public awareness campaign was conducted with 1863 citizens from 93 villages around Blora. A chief goal of the campaign was to investigate two leading explanations for political apathy in windfall contexts: weak taxation and weak transparency. According to the tax mechanism, windfalls undermine taxation and paying taxes plays a vital role in motivating citizens to demand better performance from government. In contrast, the transparency mechanism suggests that the problem is primarily an information one; citizens lack access to information on how politicians are using public funds and thus are ill-positioned to enforce good governance. To explore the impact of taxes and information on citizen political behavior, four slightly different versions of the campaign were developed. 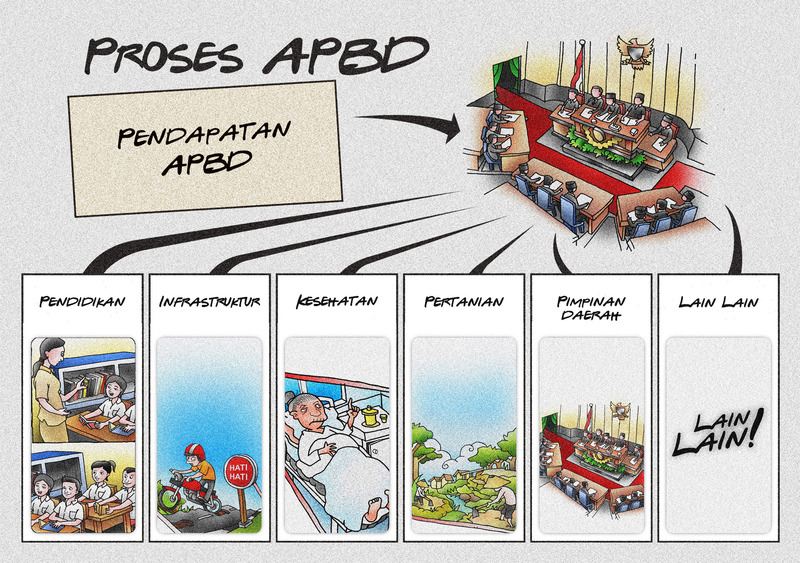 All campaign versions included basic budget literacy and awareness content. The versions differed, however, in what revenue information they emphasized (windfalls versus taxes), as well as whether they provided real information on how government managed public finances or not (see the treatment memo). Employing an experimental design—now widely recognized as the superior strategy for identifying the causal impact of an intervention—citizens were randomly sampled from the population and assigned to one of the four campaign versions (see the design memo). Any differences in citizen attitudes or behavior across the groups after the campaign can then be attributed solely to the ‘treatments’ in the different campaign versions. The campaign was implemented one-on-one by trained canvassers. The canvassers used scripts, visuals, and game boards to deliver the campaign content (see the campaign materials below). A goal of the campaign was to generate tangible public support for governance reforms advocated at the district level by the local NGO partners PATTIRO and LPAW. Each campaign participant was given an opportunity to return a postcard indicating whether they were satisfied with district government or whether they want it to do a better job. If the latter, participants were asked to asked to indicate their level of support for five different governance reforms and to select their priority reform. Participants were informed that the outcome of the postcard campaign would be shared with candidates in the lead up to district head elections, as well as with the media, civil society and other government officials. The postcards serve not only as a tangible reflection of public opinion on the quality of district government in Blora but also help to measure campaign impacts. Additional data was collected using pre- and post-treatment survey modules. The postcards returned in the Your Voice, Your Opportunity campaign reflect public opinion on the quality of district government in Blora. To fulfill the promise to campaign participants that postcard results would be shared with district head candidates, and to encourage the candidates to pay attention, a follow-on voter education activity was conducted. Postcard outcomes were tabulated and shared with all registered candidates. All candidates were given the same word limit and deadline to provide an official response. Both the postcard outcomes and candidate responses were then published in a two-page special voter education feature in DIVA, a local Blora newspaper, in the two week campaign period prior to the elections. The voter education activity was also paired with a randomized evaluation to measure whether it did indeed have an impact on mobilizing voter turnout and helping voters make more informed decisions at the polls. This evaluation utilized the fact that DIVA has limited distribution throughout Blora. Ninety-four villages (and more than 400 communinities) were randomly selected for a more intensive distribution of the voter education materials. Half of these villages were villages in which the original Your Voice, Your Opportunitycampaign was conducted while the other half had not been included in the original campaign. In randomly selected villages and communities, copies of the special feature were posted in public places and distributed both to local leaders and ordinary citizens. By analyzing electoral results at the polling station level, we will be able to investigate whether the campaign and voter education materials had on impact election outcomes. 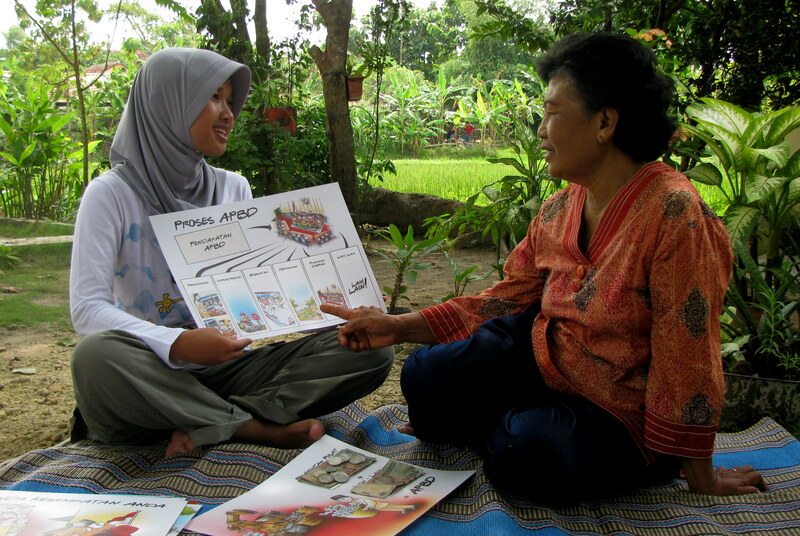 A campaign participant (and her daughter) learn about the postcard. The project was created and led by Laura Paler (Columbia University) and conducted in collaboration with the Indonesian NGOs PATTIRO (Pusat Telaah dan Informasi Regional) and LPAW (Lembaga Penelitian Aplikasi Wacana), which have been working since 2008 with district level stakeholders on the responsible management of natural resource revenue (with support from the Revenue Watch Institute and the Open Society Institute-Local Government Initiative). The program extended their efforts to the grassroots level to build public support for the good governance reforms they have been advocating. The project was made possible by grants from the National Science Foundation (Doctoral Dissertation Improvement Grant SES-0921093); the Open Society Institute-LGI and the Revenue Watch Institute; the US-Indonesia Society 2010 Sumitro Fellowship; The Center for the Study of Development Strategies, the Weatherhead Institute and the International Development and Globalization IGERT (Columbia University); and PATTIRO.